This is a replica of the neck brace worn by Bert Trautmann after he broke his neck, but carried on playing, during the 1956 Football Association Cup Final at Wembley. 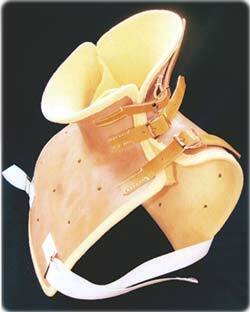 The brace is made of solid moulded leather lined with chamois leather. The original brace was made to fit Trautmann’s neck and upper torso with lacing and leather strapping for final fitting adjustments. Bernard “Bert” Trautmann was born on 22nd October 1923 in Germany and died 19th July 2013 at La Llosa, Spain aged 89 years. He joined the Luftwaffe early in 2WW serving as a Paratrooper and earned several medals including the Iron Cross. He was captured and taken to a prisoner of war camp in Lancashire, England. At the end of the war he refused repatriation and remained in England. His football talent was recognised and he played in goal for Manchester City from 1949 to 1964. He entered football folklore with his actions in the 1956 FA Cup Final. With quarter of an hour remaining Trautmann dived at the feet of Birmingham City’s Peter Murphy and suffered a serious injury to his neck. As no substitutes were permitted, and although dazed and unsteady on his feet, he continued to play on to help his team to a 3-1 victory. When he went to collect his winner’s medal it was observed that his neck was noticeably crooked. He was examined and told he had a crick in his neck which would go away. However, as after three days the pain had not diminished, he return to the hospital where he has an X-Ray which revealed that his neck was in fact broken. Five vertebrae in his neck were dislocated with one being broken in two. Fortunately, the third vertebra was wedged against the second which prevented further damage which could have killed him. 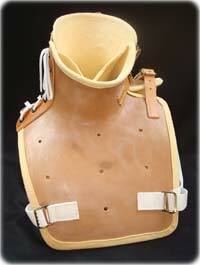 The solid leather neck brace was made to support his neck whilst it healed and he returned to championship football in mid-December 1956. Trautmann’s lunge at Peter Murphy’s feet to save the ball in the 1956 FA Cup Final is still rated as one of the greatest if not the greatest FA Cup save and he well deserved the FWA Footballer of the Year award that he received that year. A film about his amazing life, entitled “The Keeper”, was released in 2019.